Source: Wikipedia, "Dynamite Cop", available under the CC-BY-SA License. 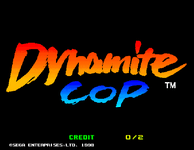 Dynamite Cop (Dynamite Deka 2 in Japan) (1998) is a video game published by Sega and initially released in arcades on Sega Model 2 hardware. The game was then ported to the Sega Dreamcast console and released in Japan, North America and Europe. Dynamite Cop is a 1 or 2 player, 3D beat 'em up in which players fight through levels to save the president's daughter from a band of modern day pirates. The game's predecessor, Dynamite Deka, was released in Europe and North America for arcades and the Sega Saturn with a Die Hard licence, titled Die Hard Arcade. Its main character, Delinger (who would have been John McClane if this game had been given the Die Hard license), makes a cameo appearance in The House of the Dead 2 as a playable character via a special item obtainable in the original mode (present in home versions of The House of the Dead 2). The classic Sega arcade game Tranquilizer Gun (1980) is included as a bonus game. Clearing all missions will enable you to play Tranquilizer Gun an unlimited number of times. As with the original's striking resemblance to the movie Die Hard, Dynamite Cop bore many similarities to the action movie Speed 2: Cruise Control.